Super AMart were kind enough to gift me the beds, stools, storage and lamps for this room makeover. This is not a sponsored post otherwise. Images by Pixelgarden Design. Growing up, my bedroom was always a hodgepodge of bits and pieces that had been handed down from friends and family. The transition from kid’s room to teen room was one that happened when my dog show ribbons made way for a Fido Dido bedspread and posters of Bros. It never really felt like a cool teen room, and it never really felt like the room I wanted as a kid either. It’s a different time now, back in those days stores like Super Amart weren’t as popular as they are now, meaning it probably wasn’t as easy to grab quality affordable pieces for your home. I can barely think of a time my parents indulged in new furniture or furnishings for themselves – they certainly never had any days where they pretended they were on The Block as they plumped pillows (this may or may not happen at my house … Hi Scotty Cam if you’re reading). It’s never been easier or more affordable to try your hand at interior design, and with a few simple tips you can make sure that the investment you make is one that will serve you for many years. For now I have Cael (6) and his sister Ivy (4) sharing a room. It won’t always be like that, pretty soon Duke, who is still in a cot, will swap places with Ivy meaning that she will be in her own room and the two boys will be sharing. I need this room makeover to be adaptable enough that I could make that switch without too much more investment of my time, or my money. By choosing some good solid basics that will both endure and evolve as necessary, I’ve set the room up to be able to accommodate that change without too much fuss. Warning: Searching ‘kids room printables’ on Pinterest will launch you down a rabbit hole of design decisions. Right now I have a folder full of bookmarked pages that I plan to revisit as soon as I have purchased some more frames. There is so much super fun art – some kooky, some motivational, and all gorgeous that you can print at home and pop in a frame. By doing this you are making wall art that can change and grow right along with your kids. I grabbed theses ones from Sweet Little Dreams, but you can find them in most department stores and online children’s boutiques. Simply stick them onto walls and furniture, and you can peel them off with no damage as the tastes and colour schemes in the bedroom change. Keep it simple is my tip here. Look for pieces that would look appealing in their rooms throughout all of the ages. Trust me, a teen is not going to want a bed with teddy bears carved into the bedhead forever. For this room I chose not to go with bunks, the high window posed too much of a jump and fall risk from this second-storey room, so we went for a classic, white timber look with the Barn beds from Super Amart. Like most of their styles, these mix and match well, and there is even an additional under bed storage option that I think might be our next investment, perfect for linen and spare pillows etc. Rather than bedside tables, I went for these funky metal stools – a little glimpse into the future predicts that these will wear well throughout the teen years. I can see them being used for guitar practice, make-up tutorials, seating for visiting mates. They are so durable who knows how long they’ll have them in their lives?! For now the storage units suit this room, because I personalised them by painting the backboards. These can be re-painted or flipped to the white side as the kids grow. Floating timber shelves will accommodate any of their treasure, simply swapping the contents will make this room as mature or personal as they’d like it to be. I chose neutral lamps, rather than coloured or printed ones, simply because keeping things basic is one way to ensure they don’t date. These lamps could be popped into any space without taking over. This is the fun part. Once you have those basics in place, you get to go nutso on the colour and fun! The ranges of beautiful linens and furnishings in department stores and online boutiques are so fun and vibrant right now, and you’ll probably be surprised by how affordable they are too. It is much simpler, and way more financial viable to change the soft furnishings in a room to give it a makeover. 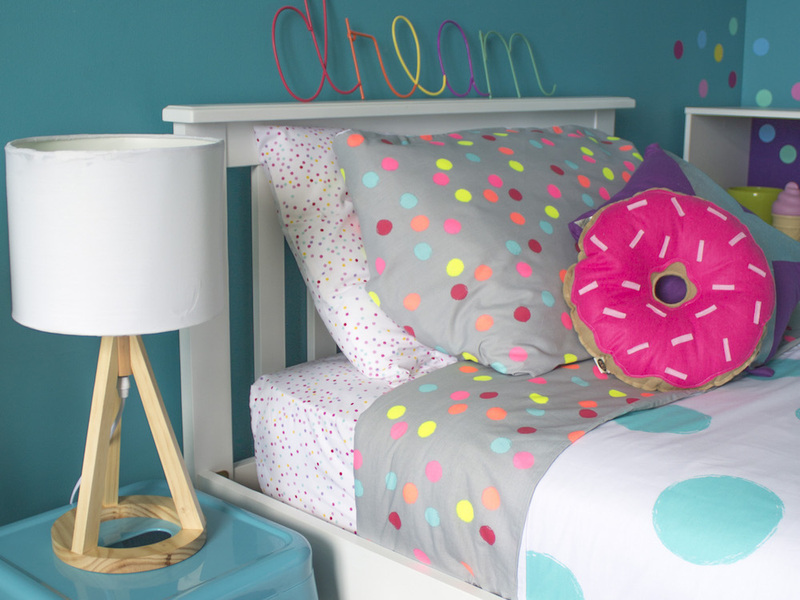 By getting those solid foundations in place, you’ve created a room that can be switched up and re-styled with your child’s evoling tastes as quickly as changing the bed linen. You’ve down an awesome job! I love it ALL ? I bet your kids are thrilled to have such vibrant fun, clean space. I never had a room like this growing up either. It was boring and tiny rental with white walls, and a sister who shed her clothes in big piles on the floor and had never heard of a laundry basket. Nice work. They are! Sisters can be real jerks. Have fun – show me pics. Looks great! Super clean and bright. Loving the doughnut cushions.